How far will I go to sample great tea in great surroundings? All the way to the end of the country, and then a bit further! 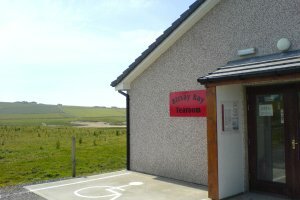 The Birsay Bay Tearoom lies at the western tip of the Orkney Islands "mainland", near to the spectacular Brough of Birsay and the remains of the historical Earl's Palace. Both of these are worth some of your time (especially the Brough, which is beautiful, though you might want to time your visit with the tides, so that you can get out across the causeway, but that's another story...) Anyway, once you've worked up a bit of a thirst, why not retreat to the Birsay Bay Tearoom for some light refreshment? The tearoom itself is accessed up the small lane that runs past Earl's Palace - at one point you come to a little sign that informs you the tearoom is 100 metres further on - well, if so it's the longest 100 metres I've ever walked, but it really isn't far, and is certainly worth the stroll. ...but what really makes this place stand out, and quality it for inclusion here, is how it makes the most of its location. Big windows look out towards the Brough of Birsay, and binoculars are lined up along the window-sills for patrons to look out and watch the wildlife. Little guide books are also provided, so you can identify and learn about what you're seeing. You're certainly see plenty of oystercatchers at this time of year, but beyond that it's a real wildlife haven - for some, sitting in the warm and dry with a cup of tea and a slice of cake is probably one of the better ways to watch wildlife. Pretty fine tea then, in a great natural location, with bincoluars and spotters' guides thrown in. Don't forget to take your camera. 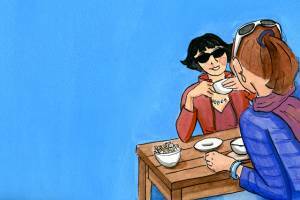 Café Délice, as the name suggests, is a lightly French-themed establishment that serves good, honest, affordable light meals and snacks... and, of course, great tea. Speaking of which, let's start with the tea - there isn't a massively wide range to choose from, but there is, at least, some choice: Twinings Everyday Tea (which I had), Earl Grey, Chamomile, blackcurrant, peppermint and lemon. Green tea and iced tea are also available (though not on the menu, oddly). One notable omission was decaffeinated tea, of which there was no sign. Now this isn't a problem for me, but if you're one of the decaff crowd then maybe you'd better stick to coffee here, as that is served in a jolt-free version. There are plenty of other alternatives too: there's a decent selection of Smoothies, plus Café Délice stocks Purity Soft Drinks, which are quite refreshing. And on top of all this, there's a decent range of food too: baguettes and sandwiches, pastries, cakes.... I had a croque monsieur (see, I told you it was French-themed). Although basic, it was tasty and filling. They also had some little tarts topped with fresh fruit which looked gorgeous but, since I'm back on a diet and I had only gone in there for breakfast, I can't report how good they tasted, only that they looked great. Back to the tea though. Served in a proper cup and saucer, with a little of jug of milk on the side and with brown and white sugar cubes in a bowl on the table, this more than met the minimum standard for inclusion on Great Tea. Twinings Everyday Tea is good anyway - a good flavour without being over-strong. A nice touch is that Café Délice serves its tea with a little biscuit on the side - diet or not, I enjoyed that with my cuppa. 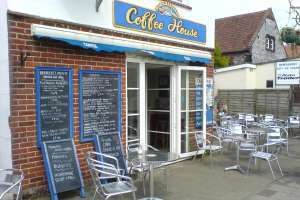 Don't be put off by the name - this coffee house serves mighty fine tea too, otherwise it wouldn't be on here! Firstly, there's the selection of teas. No, I don't mean there's a wide range of different brews available for the tea connoisseur to luxuriate in. There is plenty of choice though. Besides "ordinary" tea, there's decaffeinated, Earl Grey and herbal tea to choose from. Then each of these varieties is offered in small/cup, large/mug or pot servings. For the purposes of this review (and to slake a thirst) a large mug of the ordinary tea was consumed which, happily, was both strong and full-flavoured. Exactly what you want to wash down your breakfast... the options for which were plentiful, by the way, as you might imagine from the size of the menu chalkbaords in the photo. My partner in tea had a large mug of the decaff, and that looked pretty good too. The café itself offers a range of seating choices, including a sleep-inducingly warm conservatory and open seating which looks across towards the North Norfolk Railway steam trains as they pull into Sheringham station. Indeed, the size of the seating areas suggests that Station Approach might get very busy in peak tourist season, when the great and the good are piling into Sheringham for its old-school seaside charms. Service is friendly and the menu, as I've already suggested, is broad, ranging from breakfast specials to lunch meals and all manner of snack items too. It's not going to win any culinary prizes, but it seems to be good, honest food and you can't say fairer than that. My breaky was good anyway.